Hi, I am interested in your 1999 Chevrolet Corvette Coupe (stock #99350CV) listed on Autotrader for $16,997. I'd like to get more information about this vehicle and confirm its availability. ESTIMATED MONTHLY PAYMENT $232.00, 1999 Chevrolet CorvetteOriginal 350 V8 Engine 6-Speed Manual Transmission33k low Miles Power Steering Power Brakes Front and Rear disc BrakesRuns and drives great! 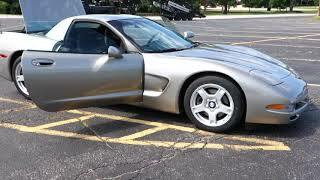 Fixed Roof - RARE ONLY 1,200 MADE THIS WAY in 99Silver exterior shows well - original paint Black interiorAll gauges are workingAir Conditioning Alpine AM FM Stereo Brand New Trunk Divider 20184 New Firestone Firehawk 500 Tires and Sensors all around 2018New Battery 2018New Serpintine and A/C Belt 2018 A/C just recharged 2018Engine just serviced with a fresh oil change 20182 Sets of Keys Located here at North Shore ClassicsWE FINANCE/ DELIVER AND SHIP WORLD WIDE , HISTORYThe C5 was the most completely redesigned Corvette since the Corvettes inception in 1953. (Corvette Racing, David Kimble, 2012). Production of the C5 Corvette actually began in 1996 but quality/manufacturing snafus saw it released to the public in mass in 1997 and continuing through the 2004 model year. The C5 was a completely new design that featured many new concepts and manufacturing breakthroughs that would be carried forward to the C6 & C7. It had a top speed of 176 mph (283 km/h) and was judged by the automotive press as a breakthrough with vastly improved dynamics in nearly every area over the previous C4 design. The list of all new innovations include:-Industry leading 0.29 Drag Coefficient-Near 50/50 weight distribution (actually 51%F/49%R) due to the all new powertrain layout-The FIRST Corvette to actually use an Upper Rear Suspension Arm, instead of the Drive Shafts performing double duty as the Upper locator arm-An All New Chassis design that was more akin to a Stressed Monocoque than former Ladder designs which featured a all new Stressed Center Tunnel design for increased torsional rigidity-All New Hyrdo-Formed side Rails increased torsional rigidity more than 4 times that of the C4 and previous Corvette generations-All New Suspension Geometries, in which the actually chassis widths and lengths changed the tracks and wheelbase instead of simply locating certain mounting points in different places that did not truly affect geometry (per what was done with the rear suspension on the C6)-All New Production of a Rear Mounted Transmission, including a "torque"(drive)shaft from the front of the engine to the rear transmission-Reduction of over 1000 parts from the previous C4-All NEW, never before seen Active Handling (it was the first ever Stability Control for a Corvette, and NOT just Traction Control for the 98/99 - 2004)-Lower Weight (3,219 lbs) compared to C4 (Note: this weight for the 97-99 model years for the base coupe was still lighter than the C6 that replaced it)-Improved Quality-Improved Fuel Economy-"Magna Steer" electronic power steering assist-First Ever Staggered Tire size (for production Vettes), with smaller sizes in the front than the rear. This was done to improve CD.-First Ever "Twin Fuel Tanks", one behind each seat, aided the packaging of the C5; it, along with virtually all of the C5s innovations have been incorporated into the C6 & C7 models as well.-First ever Dual Durometer Suspension Bushings to improve ride quality without sacrificing cornering grip and vehicle handling dynamics-Large trunk was purposefully designed to accommodate two full golf bags; and it remains a feature of the C7 (and previous C6)-First Ever Bonding to Frame for Body Panels manufacturing in Corvette production history-Super Stiff Chassis (24-25hz) made primarily of Steel is still actually stronger than the now primarily Aluminum one in the C7. Starting with the C5 Z06, and then carried through the C6 and C7 models the chassis tunnel cover thickness was increased to aid rigidity from the relatively thin Base C5. The C6 tunnel plate actually mounts perfectly to the C5 model for an easy upgrade. Note: The C7 has adjusted some of its welding patterns and thickness points to compensate for aluminums decreased rigidity compared to steel. In essence to equal the strength of steel, you must use twice the thickness in aluminum, which negates its initial lighter weight advantage (strength/weight ratio).-ALL New LS1 Aluminum Engine (a first for a production Corvette); it featured individual coil packs instead of a distributor cap and rotor, aluminum block and pistons, a very deep skirt design for increased durability, and many other technical and manufacturing innovations. The LS1/LS6 are the progenitor for the entire C6 & C7 engine lineup, with the LS2, LS3, LS7, LS9, being primarily increased displacement and supercharged versions of the LS1/LS6. Even the LT engines are still primarily increased displacement LS1s/LS6s but with modern, improved technologies of Direct Injection and Cylinder Deactivation for improved fuel economy for their larger displacement "thirstiness". This third-generation small block V8 was completely redesigned. Now all-aluminum, it featured a distributor-less ignition and a new cylinder firing order. It was initially rated at 345 bhp (257 kW) and 350 lbft (470 Nm), but was increased to 350 bhp (260 kW) in the 2001 edition. The new engine, combined with the new body and its low 0.29 drag coefficient, was able to achieve up to 28 mpg on the highway.